This is The Beast's current incarnation... or at least my best approximation. 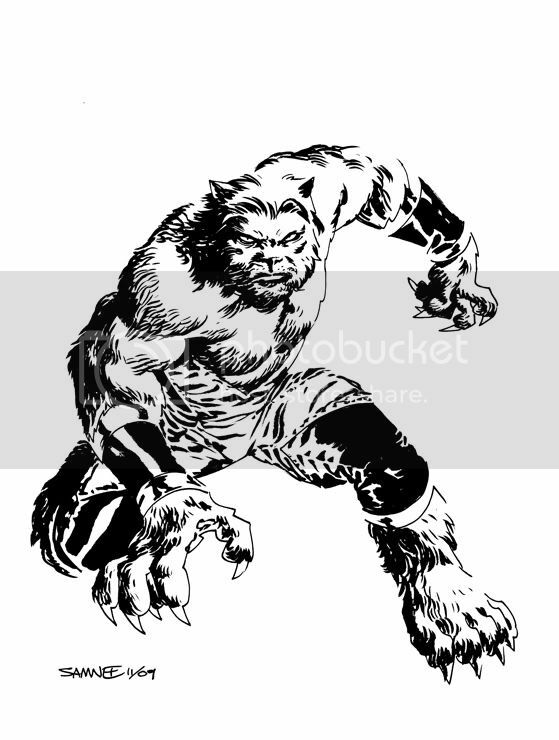 Beast's outward appearance started out as just a regular dude with big hands and feet. Later, his entire body was covered in a grey fur (soon to be replaced by blue). One of his more recent changes was becoming even more cat-like... with big ol' kitty paws and a face that just makes you want to take him home and spoil him with cat-nip toys. His mutation is currently in flux. You can read more about the Beast, whether you prefer hairless or fuzzy, HERE. Awesome. I've never been a huge X-Men fan, but always loved Hank McCoy from his Avengers days. I like this version of him quite a bit. Nice work, as always! At the risk of sounding like a sychophant, I've got to say that this is the best rendition of Beast's new look that I've seen. Quitely did a really great job updating his look, but, for me, this is the definitive version of the new design. Great feral posing and wonderful balance between the man and the monster. I love it! Glad to see that you are going to be at Emerald City, by the way. Gabriel and I will be there too! What Matt said. I also like how there is a certain intelligence apparent in his face too, not just the snarling ferocity you often see with this character. Cool drawing and thanks for the link. I wasn't reading comics when they decided to change his appearance, so nice to finally know the story behind it. Very reminiscent of Cassaday's take, but also very much you as well. Best rendition of the Beast I have seen in along time. Good job Chris!